Forest fragmentation is a process by which large forest areas are broken into smaller forest areas. Fragmentation is often a result of human development such as the creation of housing or roads. When fragmentation occurs, forest patches decrease in size. In addition, the amount of forest core decreases and the relative amount of forest edge increases. The highest amount of biodiversity is often located in the forest core, so fragmentation can greatly affect the health and biodiversity of a forest. 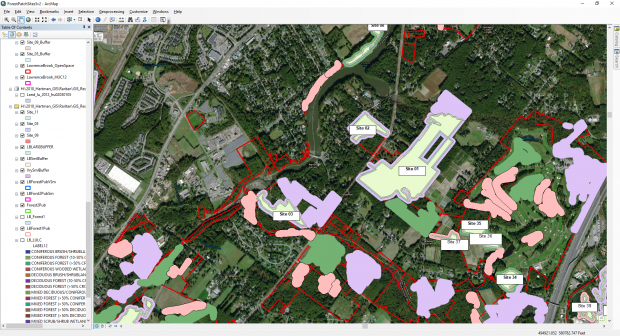 Screenshot from ArcGIS of 25-foot buffers inside and outside various sites used to calculate amount of forest interior/core for each forest patch as well as to identify land uses surrounding forest patches. Forest cover in the Lower Raritan Watershed Management Area (WMA09) accounts for less than 16% of total area, and is decreasing annually. Less than 25% of the existing forest is protected by easements, fee simple ownership or local regulations. The general health and ecological status of these forests are unknown, although we do know that high deer populations and invasive plant species threaten their long-term viability. Simultaneously, investment in expensive green infrastructure programs is rising. Protecting and managing current forest cover may be some of the most cost-effective green infrastructure. In order to generate better forest protection and management plans, we need better understanding of the current status. The purpose of this study, conducted by Dr. Jean Marie Hartman, Ben Pisano and Lubna Lakhwala, was to assess the health of various sizes of forest patches in the Lower Raritan watershed and determine the effects of fragmentation in these patches. We did this study to test the assumption that smaller forest patches have been more heavily fragmented and are less healthy than larger forest patches. 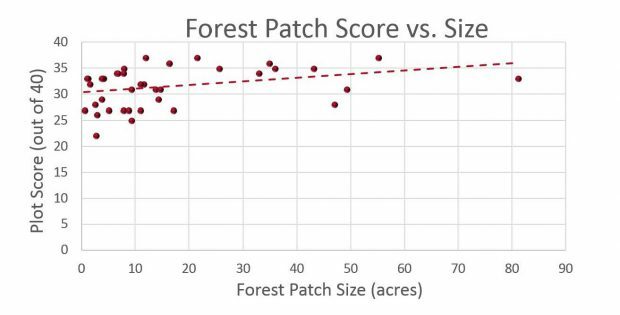 Although the graph implies that larger forest patches scored higher overall than small forest patches, the trend is not statistically significant and many of the small patches have high health scores. To do this, we visited a range of sizes of forest patches (N=80) in the Lower Raritan watershed and collected data about soil quality, tree health, biodiversity, and more. We then analyzed this data to find relationships between the data we collected with our sampling rubric and the size of the forest patches, assuming that large forest patches have not experienced as much disturbance as small forest patches. In conclusion, we found that larger forest patches had higher overall scores than smaller forest patches, based on the rubric we created. We also found, on average, that larger forest patches scored higher in certain categories, such as canopy tree health and understory native to invasive species ratio. However, we were surprised to find that many of small patches scored as high as large patches, indicating that patch size cannot be used as a singular indicator of the landscape value of forest patches. This effort was partially support by the R3C Mini-grant program to support research and student engagement on Raritan River, basin and bay resources issues. You can find more information about the R3C mini-grants here. Additional support came from the ARESTY Program and from a McIntire Stennis Grant. For more information about this effort, contact Dr. Jean Marie Hartman, Associate Professor, Landscape Architecture Department, School of Environmental and Biological Sciences. Images provided by Dr. Jean Marie Hartman.